Directed by Brenda Bell Brown. USA. 2013. 96 mins. 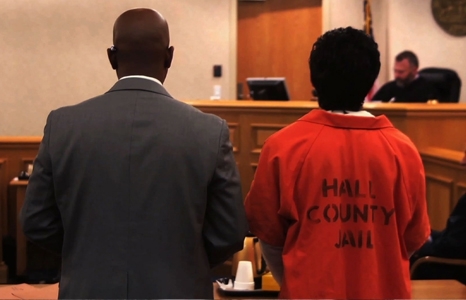 Travis Williams, Brandy Alexander and June Hardwick are three young public defenders in the Deep South who are challenging the assumptions that drive a criminal justice system strained to the breaking point. Backed by charismatic Jonathan “Rap” Rapping, who heads the Southern Public Defender Training Center (now Gideon’s Promise), they struggle against long hours, low pay and staggering caseloads. Nearly 50 years after the landmark Supreme Court ruling Gideon vs. Wainwright that established the right to counsel, can these courageous lawyers revolutionize the way America thinks about indigent defense and make “justice for all” a reality? Official Selection: Sundance Film Festival, New Zealand International Film Festival. Winner: Audience Award (Non-fiction) and Knight Grand Jury Prize, Miami International Film Festival. Sponsored by the African American Lawyers Association of Hawaii. Directed by Melinda James. USA, 2012. 20 mins. Meet three inspirational individuals at the forefront of the movement in their communities to reclaim food and our connections to it.